"To rend one's enemies is to see them not as equals, but objects—hollow of spirit and meaning." Thorn is an Exotic hand cannon and one of the Weapons of Sorrow. It is most likely named after the thorn-like spikes on it. The weapon is sleek, dark black, with many spikes or "thorns" adorning the sides, facing the front of the weapon. The projectiles shot from it also resemble giant daggers or "thorns". It was acquired via the Exotic bounty, A Light in the Dark. Thorn also appears in Rise of Iron and can be acquired through a Quest. Thorn was once called Rose, and it belonged to the Guardian Rezyl Azzir. Once a noble hero, Azzir eventually fell to Darkness, becoming Dredgen Yor after looking to the Hive to try finding more ways to defeat the Darkness. He was soon consumed by the Darkness, and he and his Hand Cannon Rose began wantonly murdering innocents and consuming their Light, . Ever since, it has been hungry for the Light of other Guardians. Whether before or after it was built, Thorn became bound to Xyor, the Unwed; killing her removes the link and enables Guardians to safely use Thorn without risk of corruption. After Dredgen Yor's fall, cleansed replicas of the Thorn were created by the Shadows of Yor, a group of Guardians who idolize the fallen Guardian. Their activity raised enough concern for Shin Malphur, Yor's killer, to take up arms against the Shadows. A year after the Red War, a Shadow of Yor known as Callum Sol was found and killed by Shin. 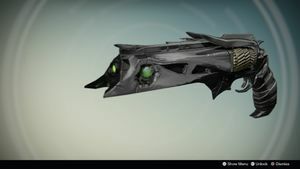 The Young Wolf would find the spot of the Shadow's final death, retrieving weapon parts from his remains for The Drifter to utilize to create a new replica of Thorn known as Malfeasance. It is later revealed that Shin's killing of Callum Sol was in fact a trap for people who are vulnerable to falling to the Darkness, and that Shin Malphur is actually a member of the Shadows of Yor himself. Thorn, like every exotic in Destiny, has a "signature perk". Thorn's is called "Mark of the Devourer", which allows rounds fired from the weapon to pierce the target and cause lingering damage over time,  which, in PvP, could potentially prevent a fleeing Guardian's shield from regenerating quickly enough for a kill-shot to be delivered. This perk has since been nerfed from its Year 1 iteration. Final Round: The last round in a magazine deals bonus damage. Send It: Increases range and accuracy. Harder to handle. Decreases carried Ammo capacity. "The Weapons of Sorrow are not the endgame, but a road map. Each evolution, every advance in the delivery of pain and the mastery of destruction feeds the Hive's hateful weapons research. They will map every scream, harness every aggression, until they understand every method by which to ravage the hearts, minds, and flesh of man. And in doing so, they will turn us against ourselves—feeding our lust, our greed, our fear, until we become a threat unto ourselves like none we could imagine. So, wield these, angry reaper. Strive to know the darkness in your own heart. Walk in the shadows of fallen heroes. And know that you are an enemy of hope." Corkscrew Rifling: Balanced barrel. Slightly increases range and stability. Slightly increases handling speed. Accurized Rounds: This weapon can fire longer distances. Increases range. Textured Grip: The friction on this weapon's grip is particularly strong. Greatly increases handling speed. Slightly decreases stability. The Thorn has been labeled as the "yin" of the Destiny universe (as opposed to the Last Word, which is the "yang"). Thorn was originally described as being one of the loot in Charlemagne's Vault, a chamber in the Dust Palace that does not appear in the final version of Destiny. Reference chart of the Thorn. Left and right side views of the Thorn. A Warlock wielding the Thorn.